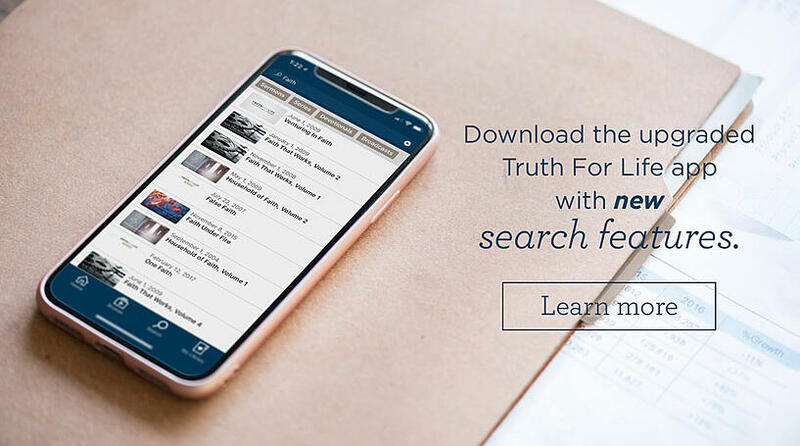 The upgraded Truth For Life mobile app contains a brand-new search feature that makes it easy to search the entire Truth For Life teaching archive—including sermons, series, broadcasts, and devotionals—by topic, title, or keyword. By clicking on the search icon in the bottom bar, you can enter a topic, title, or keyword in the top bar and access a complete list of series, sermons, broadcasts, or devotionals that match your search criteria. If you’re looking for just a devotional on a particular topic, or just a single sermon on a topic, simply select the category from the four gray highlighted boxes to narrow your search.